This Italian-made Jaws knockoff is unusual but not very good. The first twenty minutes show promise: despite the inherently silly premise, the first act shows some oddball humor and unique visuals that make the proceedings interesting. Sadly, Tentacles starts to fall apart once it gets into its plot. There are too many characters, the dramatic focus drifts to and fro and director Ovidio Assonitis lets his pace lag when it needs to be tightening up. He manages the occasional effective setpiece -- the best is a scene where a boat is attacked at night by the octopus. Unfortunately, there are even more scenes that play out in a ludicrous and unintentionally funny manner, key examples being a sequence where the octopus attacks a sailing competition as if it were a submarine and another bit where Bo Hopkins gives a deadly serious pep talk. . . to a pair of killer whales. 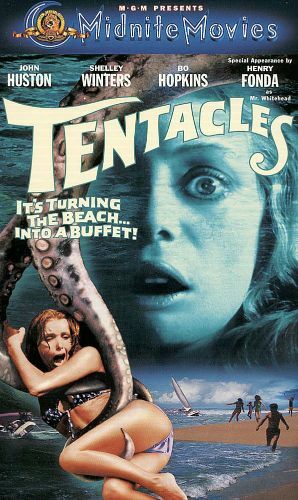 The best aspect of Tentacles is probably the cast, which is full of old pros like Hopkins, John Huston and Shelley Winters. They all acquit themselves nicely, particularly the scene-stealing Winters, but it's all to little avail because none of them have fresh or interesting characters to play. In short, Tentacles is a slightly intriguing footnote in 1970's horror history but the novelty wears off before the end credits roll. Any viewer wanting a fun Jaws rip-off should stick with the original 1978 version of Piranha.